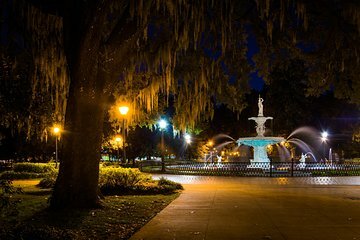 If walking around at night isn’t your thing, you can still take a Savannah ghost tour with this tour by comfortable sprinter van. Cover more ground than is possible by foot as you drive to spooky sights around the city. As you go, your guide shares tales of pirates, old-family folklore, and hair-raising ghost stories about Georgia’s oldest colony. Fully Narrated Uninterrupted 90 Minute Tour about pirates, historic families, folklore of voodoo and haunts. Complimentary pick up and return to Savannah's Historic District Hotels. Following tour guests will return back to their choice of Historic District Hotels, City Market, Savannah Visitors Center or River Street. Full of history and stories.